Mad Hatter Cupcakery – Glebe Point Rd, Glebe. 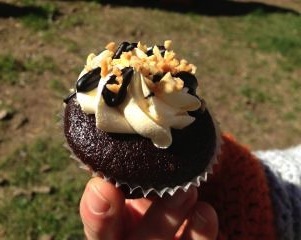 These fantastic cupcakes can be found all over Sydney, but especially at Glebe Markets every Saturday. They are also at Newtown Markets on Saturdays, have a popup shop in Broadway Shopping Centre and supply Loaf and Devotion on York St, Sydney and Revolution Foods on Enmore Road, Enmore and can be ordered online. Their amazing cupcakes come in flavours like snickers, golden gaytime, salted caramel popcorn and red velvet.